I live in Big Rapids. Recently my cat disappeared. It was really bizarre because Jasper hates the outside, is afraid of it and would have never run away. Desperate to find him I started searching around town. Police sirens muffled the sound of an animal screeching and a deep humming laugh sound. And just like a block behind the saw mill I found him. I was horrified to find him dead. I was probably more horrified to see I swear to you the ghost of a man standing next to him just staring me down. Sort of just staring me down. I ran to Jasper and it looked like the ghost had stomped on him or kicked him. I get queasy when I hear police sirens still. It was awful. I can't stop thinking about that stupid story when I was a kid about the Big Rapids guy who was found dead in his house where the police found this big pile of notebook diaries. Inside they were crazy ranting confessions of being the doer for the random ''pet kickings''. After he had died tons of cats started going missing. We joked about it a lot calling him ''Alfred the cat kicker'' but at girl scout camp in 3rd grade when Jessa and I hid behind the lodge house and made cat noises and my mom grounded me for like 2 weeks. If you're looking at the orb those are almost always caused by dust/bugs or by low quality cameras. If you're looking at the unusual occlusion then I think you might have something, have you been able to get any other pictures?. 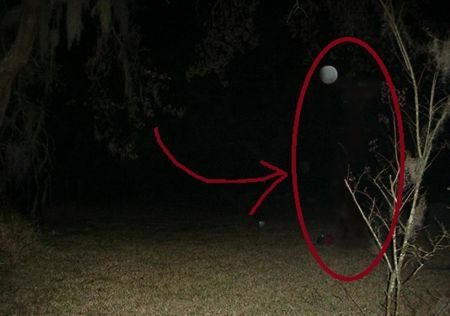 Orbs will have a glow around it and sometimes a face in it and sometimes a tail behind it like a comet.